Cosy or Cozy – What’s the Difference? Home » Cosy or Cozy – What’s the Difference? When you are safe and warm, you probably think it is a good time to write. But what word should you use to describe your current conditions of safeness and warmness? Several options come to mind, but one of the best ones is cozy. How should this word be spelled, though, with a Z or with an S? There are many different spellings of this word out there, but only two of them are correct. 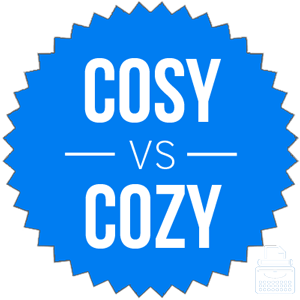 What is the Difference Between Cosy and Cozy? In this post, I will compare cozy vs. cosy. I will go over the correct spellings and use them in example sentences, so you can see how they appear in their proper context. I will also show you a mnemonic device that will allow you to easily choose either cozy or cosy correctly whenever you need the word for your own writing. What does cozy mean? Cozy is an adjective that means warm and comfortable, often when describing someone who is bundled up in many layers. Cozy can also mean close or intimate. Once the babies were safe and cozy in their cribs, the adults got out the board games and drinks and had a fun night all to themselves. “I noticed you and Tom are getting pretty cozy lately,” Allison said to Jennifer as they were walking home from the party. In some informal contexts, cozy is a noun that refers to a soft covering to keep a dish hot. Mother held the bowl of potatoes in its cozy to keep it warm on the car ride to Grandma and Grandpa’s house. Cozy is the standard American English spelling of the word, so if you are an American writer, you will want to use this spelling exclusively. Cozy was first used in English in 1709. It comes from a Norwegian term with roughly the same meaning. What does cosy mean? Cosy is the British English spelling of cozy. Just as cozy is used in America, countries that follow British English conventions use the spelling cosy. We can see the difference in usage trends with digital records. The following charts graph cosy vs. cozy in British English and American English, respectively. [The word] is always spelt with -sy in British and in most other English-speaking countries except the US, where the standard spelling is cozy. We can clearly see this in the charts above, as they are mirror images of each other. Additionally, cozy and cosy are the only correct spellings of this word. Other variants include cosey, cosie, cozie, and cozey, all of which are spelling errors. Each of these two spellings is correct in its respective language community. Cozy is the standard spelling in American English. Cosy is the standard spelling in British English. All other variants are considered spelling errors. Since cosy and British both contain the letter S, you can use this trick to remember to spell the word cosy if you are writing for a British audience. Is it cosy or cozy? Cozy is an adjective that means warm and comfortable or close and intimate. There are many wrong ways to spell it, including cosey, cosie, cozie, and cozey. Cozy is the American English spelling. Cosy is the British English spelling. 1 What is the Difference Between Cosy and Cozy? Caddie or Caddy – What’s the Difference? Repository vs. Depository – What’s the Difference?